Best Night Out Ever | Enter Now For Your Chance To Win! Win Your Best Night Out Ever! In partnership with Design My Night, the events and party specialists who craft the perfect nights out for you. Fancy partying all night in the Big Smoke with your friends just on us? Can you see yourself living it up in the lap of luxury staying at a glamorous five star hotel in London + free dinner and drinks + a nightclub VIP ticket? AND you will be dancing the night away wearing a gorgeous designer Alesha Dixon dress? Not forgetting you can invite three of your best friends to join the party too (all wearing a free Alesha dress, of course!). Too good to be true? Simply, read on for more details on how to enter this amazing Black Friday giveaway. But remember, you have to sign up to our newsletter by leaving your email address in the signup form below to stand a chance of scooping this top giveaway. 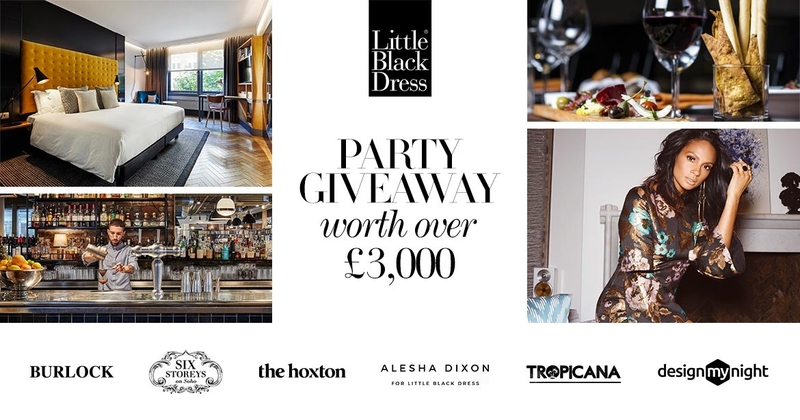 Our £3000 giveaway includes a luxury one night stay at the top London hotel, The Hoxton, for you and three of your friends! We've teamed up Design My Night along with some of the top bars that London has to offer including the Six Storeys restarant, to give you the ultimate night out. Not only that, but you can each select a dress from the Alesha Dixon's newest and exclusive collection to wear on the night. 1. You and your friends will check into the Holborn Hoxton Hotel where two rooms will be available at your leisure. Relax and absorb the trendy atmosphere - it's a popular spot and incredibly central to all the London sights. 2. After you change into your gorgeous new Alesha Dixon dresses, you and your friends can enjoy a bottle of fizz (on us) at the hotel bar. 3. In the evening, you will be whisked off in a cab (on us) to the hip and happening Burlock bar in Marylebone for free drinks. 4. We've booked you and your friends a table at the luxurious Six Storeys bar and restaurant - a beautifully themed Georgian Townhouse - where you can enjoy a bottle of wine (on us) with your dinner. 5. The night continues on to the Tropicana Beach Club where a VIP table will be waiting. You can enjoy the flamboyant ambience of this unique venue's entertainment and their exotic cocktails! For your chance to win this fabulous prize, all you have to do is sign up with your full name and email address using the form above and then repost, share, retweet and of course like our social posts throughout November!